Damaged Condition: The monitor is severely damaged. The box was destroyed, perhaps the carrier mishandled the product. The monitor does not turn turn on and should not be expected to work. This listing is FOR PARTS and NOT WORKING - NO RETURNS ACCEPTED. Acer G276HLGbd - LED monitor - 27". Its 27" diagonal LCD screen is designed with an anti-glare coating, making it easier on the eyes. It uses a 16:9 aspect ratio, allowing for the best display of movies. 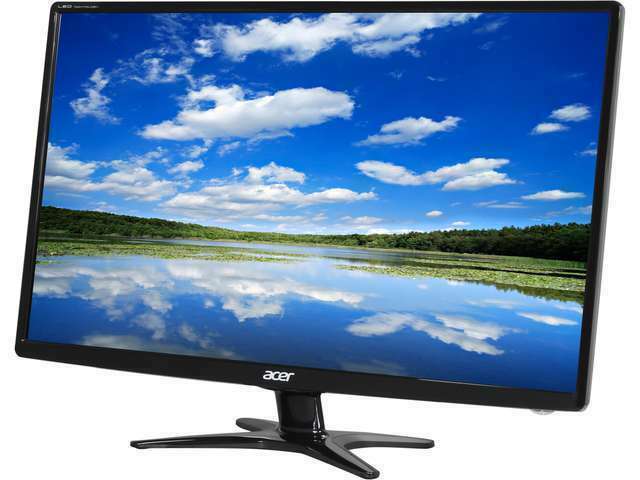 Upgrade your internet-viewing experience with this Acer 27-inch monitor. This sleek G726HL monitor will improve how you view your photos and videos. Whether you rely on your monitor for work or you want something that enhances your gameplay, count on the Acer G276HL Gbd. This monitor has a widescreen display built for delivering the crisp details of your favorite movies, websites, and photos. The LCD display has a resolution of 1920 pixels x 1080 pixels to deliver amazing visuals. It has an LED backlight to provide a high-quality viewing experience. The device measures about 24.5 inches by 7 inches by 17 inches. With its slim design and X-shaped stand, the Acer G6 G276HLGBD can be placed on small or large desks. This widescreen computer monitor supports both DVI and VGA, so you can hook it up to your desktop tower or plug it into a laptop to gain more screen real estate. Supporting 16.7 million colors, your photos look clear and vibrant in full HD. It has a 1.78:1 aspect ratio and a 100 million:1 contrast ratio. The screen is matte, so you do not need to fight any glare. Fast-moving video also stays sharp and vivid thanks to the monitor's 6-millisecond response time. If you are looking for a gaming monitor, look no further. This Acer G276HL LCD screen runs DVI-D to prevent image ghosting, especially when playing games that need a more powerful graphics card. The different settings are easy to adjust, so you can go from playing games to watching videos to typing up documents in seconds. The black levels ensure that your game images are clearly defined and vivid. This Acer monitor also has internal speakers, so you do not need to worry about the additional cost of external speakers. The device itself comes with an X-shaped base so that it fits snugly in just about any space. This base also keeps the monitors stable while you are using it. You can tilt it up and down to get the best viewing experience possible. The horizontal viewing angle is 170 degrees while the vertical viewing angle is 160 degrees. Certain accessories like a DVI to HDMI converter can be added to this computer or laptop screen to give you more options. The connecting ports that this monitor has are in the back, making it easy to connect it to your tower or laptop. Because its connections are out of the way, you do not have to worry about a mess of cables taking over your workspace. Accessories that come in the box with this device include a VGA cable, a DVI cable, and a power cord. With the monitor's Energy Star certification, you can enjoy writing documents, playing games, or browsing the web for hours without running up your energy costs. Even better, all of the packaging that comes with this device is recyclable, so you can help protect the environment. In addition, setting up these monitors is a breeze. In fact, within minutes you can be watching your favorite movie or engaging in boss fights on your new, widescreen monitor. As a photographer I demand high quality, crystal clean clarity and durability. I bought 2 of these monitors (one vertical for portrait editing), and I use them 16-18 hours a day, 7 days a week and, yes, 365 days a year. I also live on a "tropical" island where weather tends to kill electronics quickly. If not for the 100ºF or typhoons, hurricanes, and tropical storms it wouldn't be any fun. These monitors have survived all of these to date. Use a pro-calibration tool to set them and forget them. They hold their own, even in tropical weather conditions. Bought 3 of these for my triple monitor mount, and I like them, the colors seem to be the same on all of them, I'm not a graphic designer, and have protanomaly, (color deficiency) so I can't comment on how true the colors are, but it looks good to me. 1080p, so the pixel density isn't amazing, but the price is good, and it's a nice upgrade for me. Very thin, extremely light, it was incredibly easy to mount these. Not a huge fan of the external power supplies, but at least it means I won't have to tear them open to replace them if it goes bad, I suppose. It actually looks better than my Viewsonic does, is very thin and lightweight and the screen was completely smooth and pretty (not scratched or scuffed like you might expect from a refurb). Damn good price too! I might just buy another one. This is a great monitor. Anything bigger would cause my eyes permanent damage. It is clear, bright, and there's absolutely nothing not to like about it. Thumbs up for this display! It is very bright and has good contrast and color.